Microsoft today started forcing users of the first public Windows Live Messenger 2009 Beta to upgrade to last month's Release Candidate (v14.0.8050.1202). Plus! users will find that the add-on is incompatible with this build, but Patchou has let us know he's releasing a public beta of Messenger Plus! Live 4.80 tomorrow that will work with the RC! You can either wait or uninstall your Beta using ZapMessenger and then install Windows Live Messenger 8.5 for use with Plus! 4.70. The final version of Messenger Plus! Live 4.80 will be released in about two weeks and thanks to Patchou going through a few hoops, it will still support skins! The latest Mess.be updates should be available in your favorite RSS reader again! Thanks for the many notices I received from you guys. A better RSS feed is on its way too. >> Subscribe to the Mess with Messenger RSS feed. OX-2 International has today been fined 85.000 euro (about $116,000 US) by the Dutch Consumer Authority for obtaining Messenger login information from consumers and then spamming their contacts with instant messages about the company's services. Late 2007, OX-2 promised a prize or a free ringtone to visitors of Jijwint.nl, iPhonegame.nl, Winps3.nl and Realtonekado.nl (all taken offline by now) in exchange for their Windows Live ID and password. The company subsequently used the collected login details to send a commercial offer to their contacts, feigning it to come from the owner of the account. The accused company lodged an objection to the penalty and denies any abuse of login information, saying it formally asked its visitors for permission prior to sending a one off promotional invitation to their contacts. It is the first conviction of a Messenger spimmer to my knowledge, but there are plenty of other websites out there with the same bad intentions. The fine also takes into account the fact that it was unclear how to contact OX-2 in case of complaints, a common practice among these scammers. A few confused Messers have notified me of the release of "the final version" of Windows Live Messenger 2009 as hinted by Steve Ballmer at CES, Las Vegas. However, the build (14.0.8050.1202) that currently comes with the Windows Live Essentials installer is the same as the one from the beta refresh mid-December. Same features, same bugs, so there's no need to update. Microsoft has struck a deal with Facebook, adding the social network to the growing list of "web activities" that can be pulled into the What's new feed in Windows Live Wave 3. This implies that you'll be able to check out status updates and new pictures from friends in your network, not only on the Facebook homepage but also on your Windows Live Home and Windows Live Messenger as well. Seeing Microsoft's minority stake in Facebook, I guess the deal was always around the corner but it's good to see it come up to our expectations. So expect Facebook to appear as one of the available Web Activities in the coming months together with a few dozen other services. In other news coming from the Consumer Electronics Show (CES) in Las Vegas, Dell will pre-install the Windows Live Essentials on most of their consumer and small business PCs worldwide starting in February. That's A LOT of potential new users. "The invitation from %1 to start File Transfer was automatically declined because %1 is using and older version of Windows Live Messenger." By default, stuff you send with Beejive IM is automatically uploaded and then sent to your buddy as a link, so leave the options alone if you don't want any problems with Messenger. If you want though, you can change the file transfer method to direct transfers in the BeejiveIM menu of your iPhone/iPod's "Settings". I also tried and failed to send a document from Windows Live Messenger 2009 to my account on Beejive IM. My text messages arrived in a split second, but file transfers were never acknowledged. Beejive IM is a terrific instant messaging app, but the current 2.0 version does seem to have issues with the Messenger protocol when it comes to file transfers. Here's hoping for a fix! If you have different experiences, be sure to let me know. >> Get Beejive from iTunes. 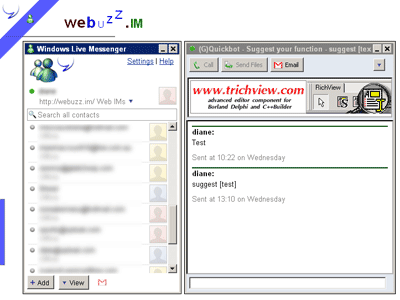 WeBuzz.IM is yet another multi-IM client for the browser with support for Windows Live Messenger, Google Talk, AIM and Yahoo! Messenger. The service has been active under the iZuZ name since April last year, but has recently been renamed and relocated to WeBuzz.IM. Counting over 20.000 users since the start of the new year, WeBuzz.IM is still way behind longtime market leaders Meebo and eBuddy, and not just in number of users but also in features. It'll be a challenge for them to grow with so many alternatives around, but if they can keep the ads to a minimum and vouch for a reliable service, WeBuzz.IM could appeal to those looking for a minimal web-client and fans of Google Talk. A word of warning though: if they keep sending out the automated "( talking to you through http://webuzz.im/ web IM )" message in every conversation, they might trigger the dreaded SPIM-filter like eBuddy did. >> Give WeBuzz.IM a buzz. >> Visit the I buzZ U buzZ, We BuzZ blog. Landing pages are an important part of the success of Windows Live, and a lot of thought goes into them. Every so often, MSN France tries out new concepts and layouts, instead of using universal landing pages like get.live.com. That's why they recently commissioned their trusty marketing agency Heaven, in cooperation with Opo and Hook Network, to build a site for the launch of Windows Live Wave 3. The goal of windowslive.fr is to give the Windows Live ecosystem an attractive but more mature look. Immediately browsing to the Windows Live Messenger page, we notice it offers a pretty good summary of what's new in version 2009. But the real show piece is this subpage listing over 50 changes in Windows Live Messenger 2009, complete with links to step-by-step instructions on how to enjoy them. An impressive and useful overview, even for the advanced user. >> Download the free 3D Emoticons pack (French). NOTE: Uncheck the three options on the second screen of the setup to avoid messing with your (default) browser settings. - Tap the top bar during a conversation and instantly send new or existing pictures (either as a link or as a file transfer) or send push-to-IM voice notes. - Starting with 2.0, you can accept incoming file transfers of a number of supported audio, video, and image formats, Word, Excel, and PowerPoint documents, and PDFs. These will be opened by the appropriate apps on your iPhone, and you can choose to forward received files to other contacts. For more details, check out the preview on TechCrunch. The app will keep its $15.99 price tag, but those who purchased 1.0 can upgrade for free! >> Buy Beejive from iTunes.